Albums, by developer Random Sequence, is a $3 app that provides an alternative, and somewhat unusual, way to select music from your iPhone, iPod touch or iPad’s music library. Pick a Record: Albums uses visual and tactile cues to let you control music playback on your iPhone, iPod touch, or iPad. 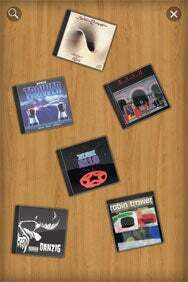 The app’s screen presents a view of a wooden tabletop containing a selection of CD cases, which you can move and rotate however you want. To add an album, tap on a button to reveal the music stored on your device, then tap on an album’s name to place it onto the table. To remove something, tap another button which zooms the view back slightly, exposing the floor around the table; from there you fling the CD cover to the floor, removing it from Albums. Albums is a hybrid app, so it provides separate interfaces for the iPhone and iPad. Unfortunately, the app doesn’t provide a bigger tabletop on the iPad’s bigger screen, but it does help make the album art easier to see and the music selector window easier to manipulate. Although the app doesn’t appeal to my style, I give the developer kudos for taking a quirky approach to a common problem. For an app that provides such limited functionality, though, and with some obvious touches missing (such as the rudimentary playback controls), the $3 price seems a little high. But if you’re the visual type who likes to keep your favorite CDs at your fingertips, then you might not mind the price.